So you did a MovieTalk…now what? Here’s something I’ve been playing with to assess reading, and it’s a great followup activity to a MovieTalk. What’s a MovieTalk? Martina Bex explains it well here. I typed up the story in a table with each paragraph in its own box. I also left an empty box next to each paragraph. It’s hard to describe but easier to see. Here’s the document. In class today students read and translated with their partner, making sure that they both totally understood the story. I was available to help with any unclear parts. Then I projected screenshots of the video, which I had put into a google slides presentation. Working alone, students o re-read the story, and wrote the slide number next to the paragraph that described it to demonstrate their reading comprehension. (We did not re-watch the video before this activity, because I wanted to assess their reading comprehension, NOT their memory of the video’s events) I found that displaying 4 slides at once (in the top photo) was easier than projecting one at a time, so fast students could move on while slower students had plenty of time to finish. They were very focused, which was a huge win, considering it was my last period, full of freshmen boys, on a Friday afternoon before a 3 day weekend! 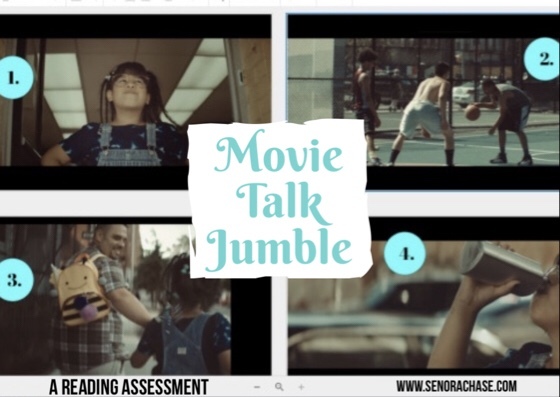 Here’s another MovieTalk jumble to use with the Don Omar’s video Pura Vida. Here is the reading and here is the slideshow of screen shots. Feel free to take it and try it! Let me know how it goes for you and your classes. Thank you for your sweet note! It really means so much to me! I’m delighted you’ve found something useful and thanks for stopping by! Wow – I got to this post from the “Rock Paper Scissors” post and am so grateful to you for posting the resources and the clips of you executing (in the “Rock Paper Scissors” post). It helps so much to have such concrete examples and resources. I’ve been experimenting with MovieTalks this year for the first time, and with some success, but I learned from watching your video that I don’t need to describe so much detail every time and that I can involve my students more in co-narrating the clip with me. And the “Jumbles” are amazing – such a great way to extend and assess the experience! Thanks Sarah, so glad you’ve found something useful!